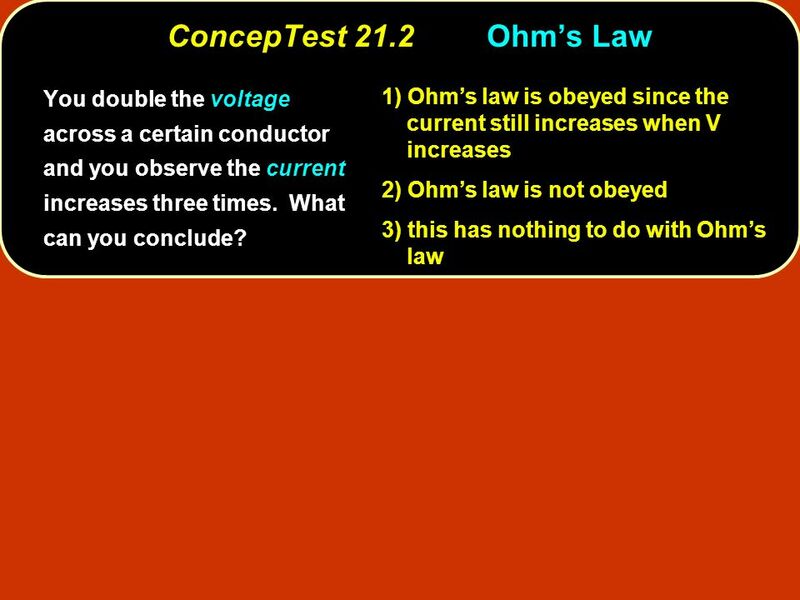 3 Ohms law is obeyed since the current still increases when V increases 1) Ohms law is obeyed since the current still increases when V increases Ohms law is not obeyed 2) Ohms law is not obeyed this has nothing to do with Ohms law 3) this has nothing to do with Ohms law ConcepTest 21.2Ohms Law You double the voltage across a certain conductor and you observe the current increases three times. 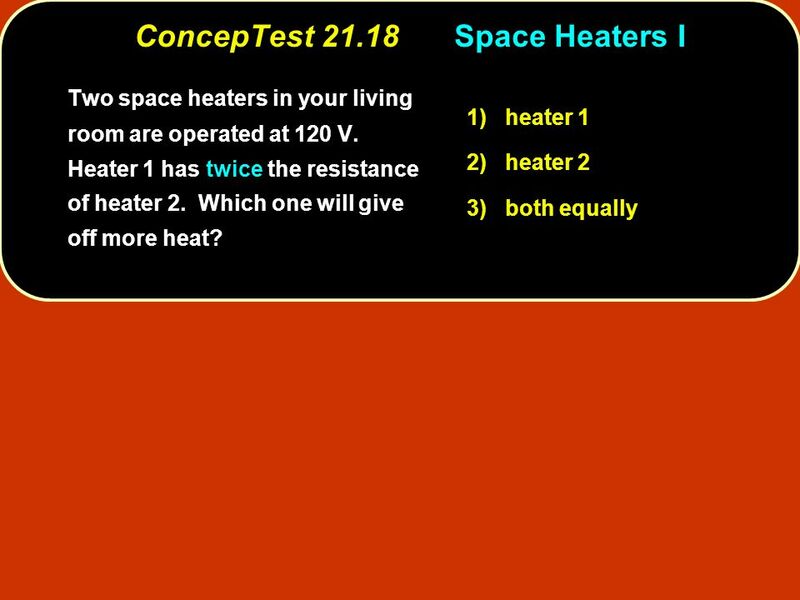 What can you conclude? 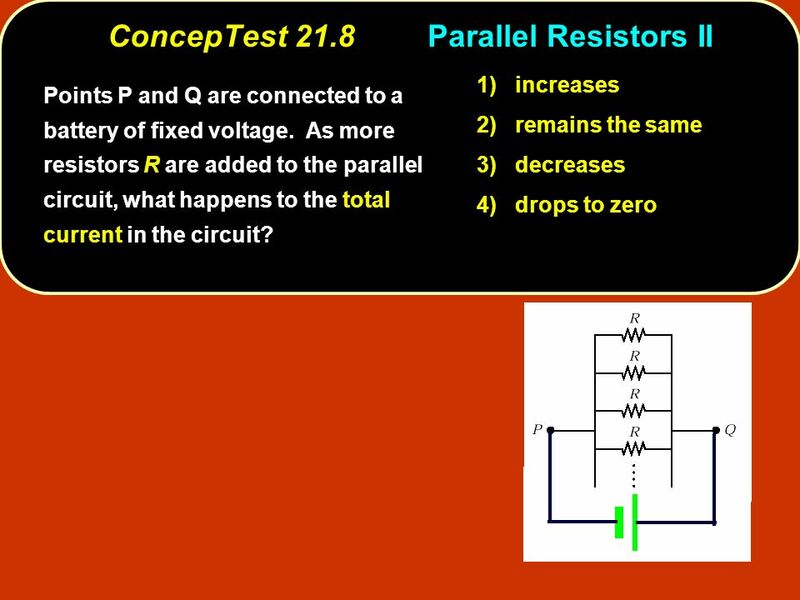 10 ConcepTest 21.8Parallel Resistors II 1) increases 2) remains the same 3) decreases 4) drops to zero Points P and Q are connected to a battery of fixed voltage. 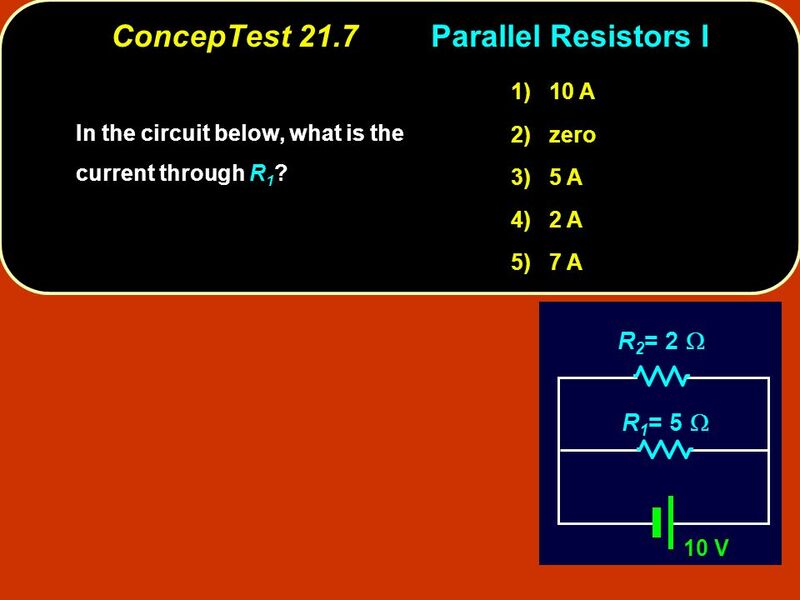 As more resistors R are added to the parallel circuit, what happens to the total current in the circuit? 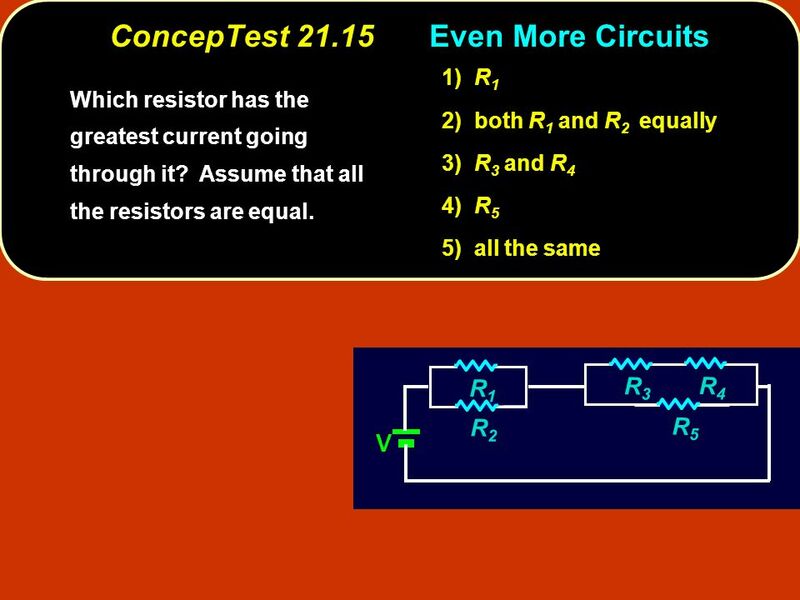 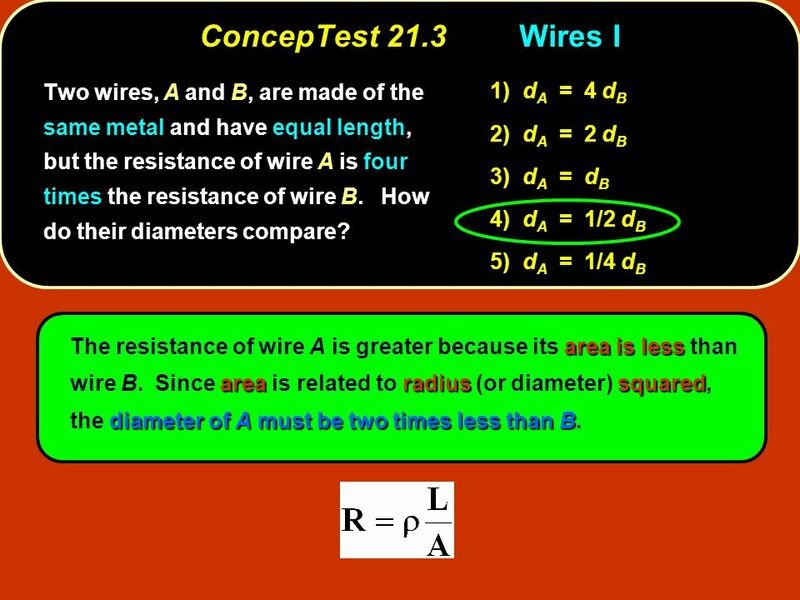 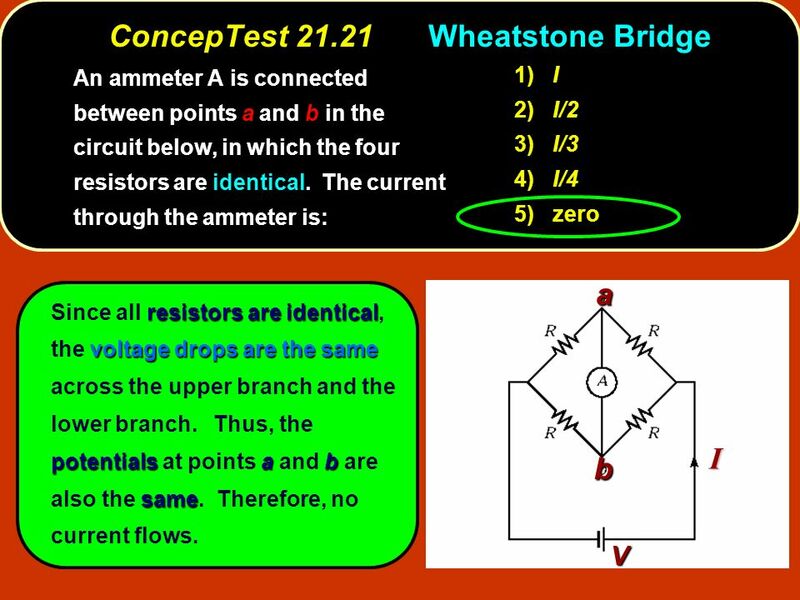 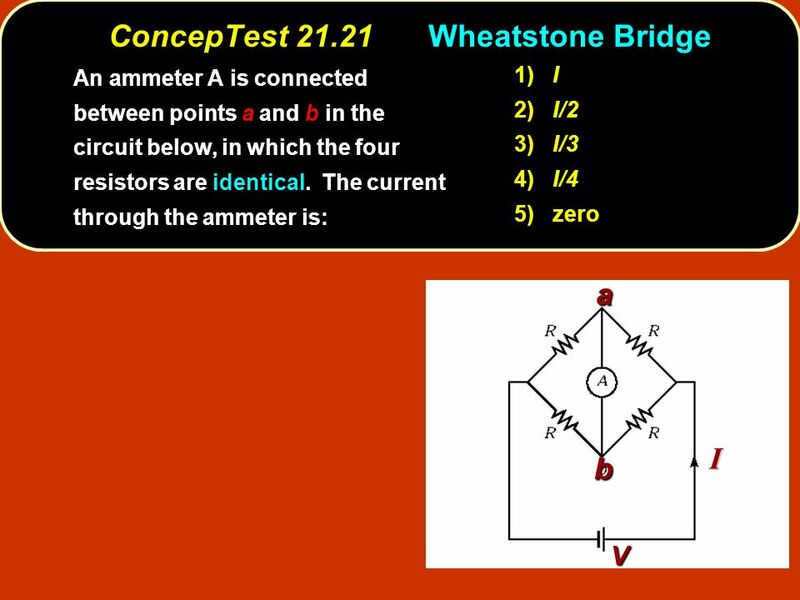 16 ConcepTest 21.14More Circuits II increases 1) increases decreases 2) decreases stays the same 3) stays the same V R1R1 R3R3 R4R4 R2R2 S What happens to the voltage across the resistor R 4 when the switch is closed? 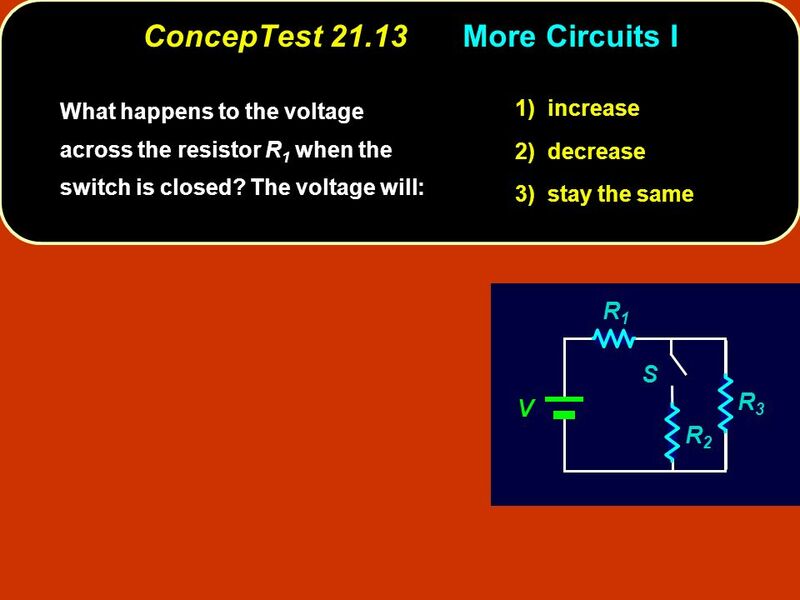 19 increases the resistancedecreases the current The voltage is provided at 120 V from the outside. 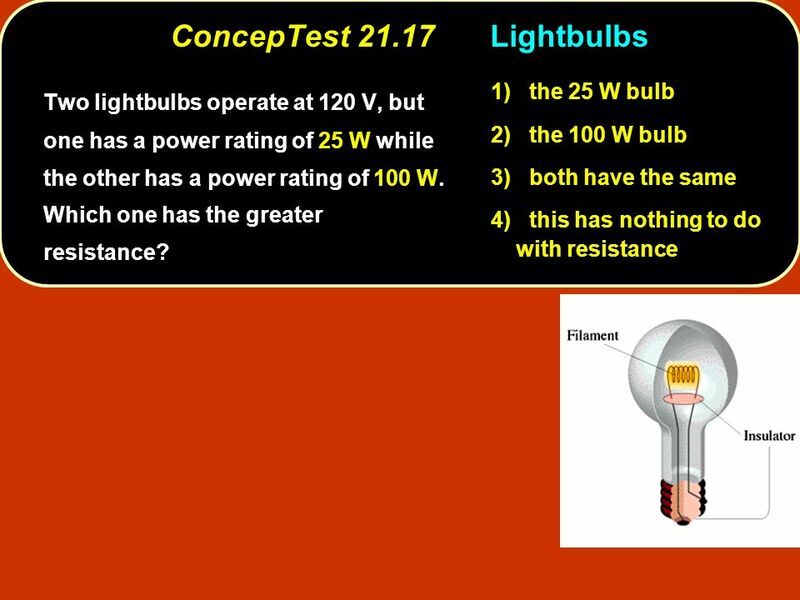 The light dimmer increases the resistance and therefore decreases the current that flows through the lightbulb. 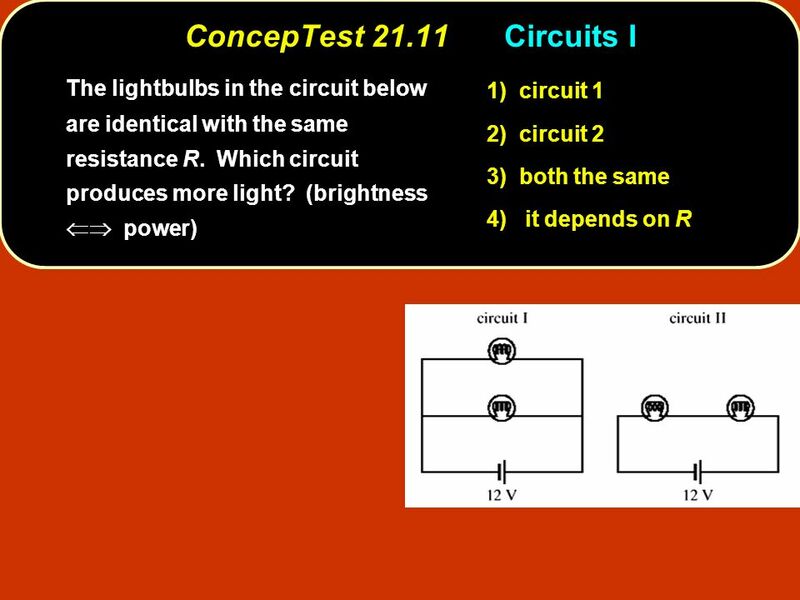 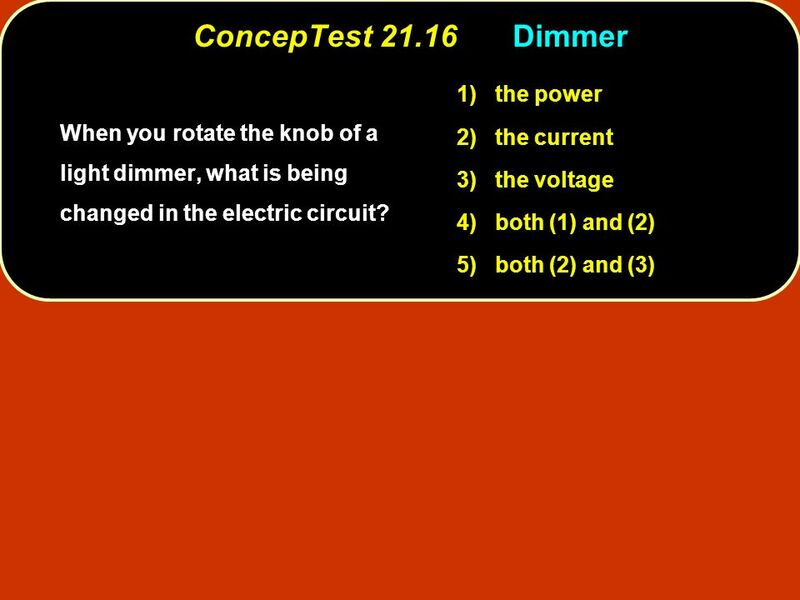 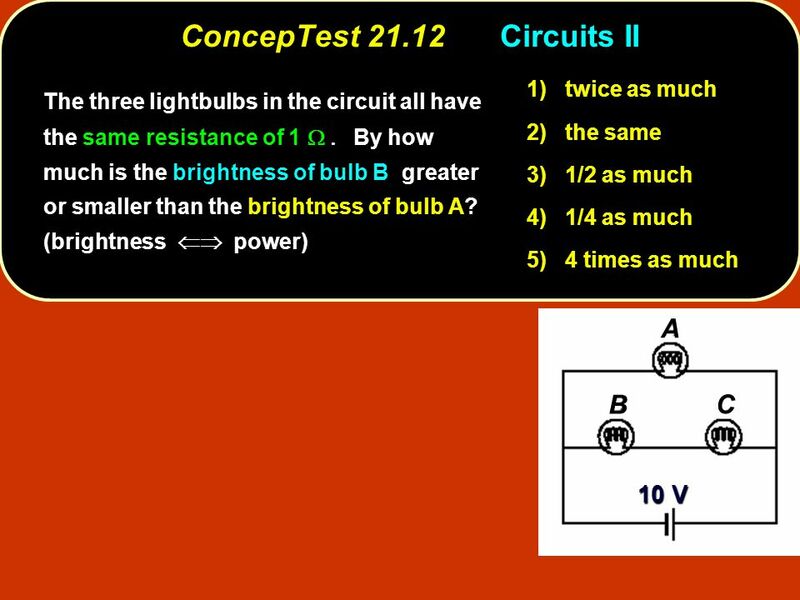 ConcepTest 21.16Dimmer When you rotate the knob of a light dimmer, what is being changed in the electric circuit? 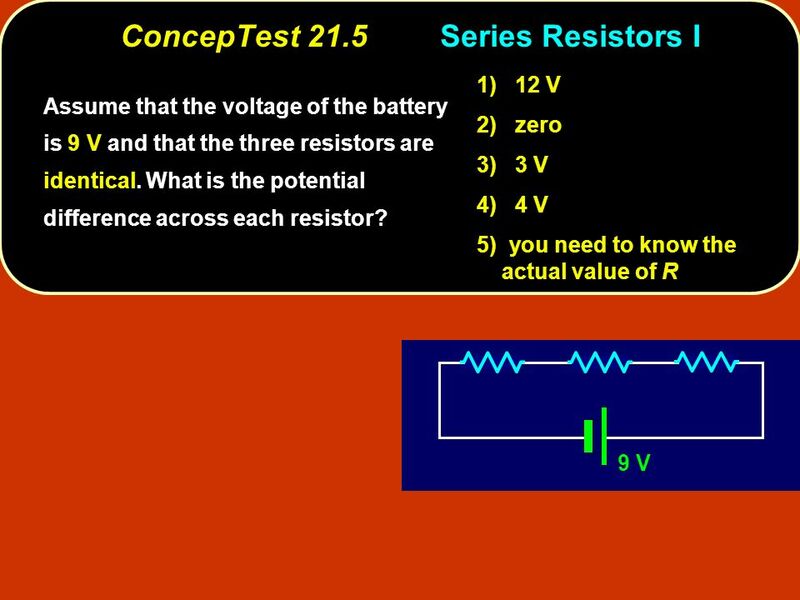 1) the power 2) the current 3) the voltage 4) both (1) and (2) 5) both (2) and (3) Follow-up: Why does the voltage not change? 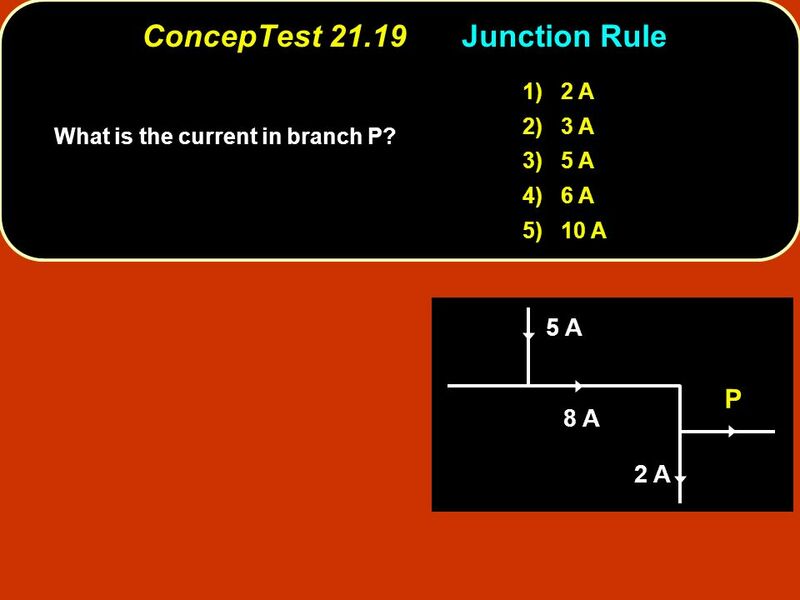 22 ConcepTest 21.19Junction Rule ConcepTest 21.19 Junction Rule 1) 2 A 2) 3 A 3) 5 A 4) 6 A 5) 10 A 5 A 8 A 2 A P What is the current in branch P? 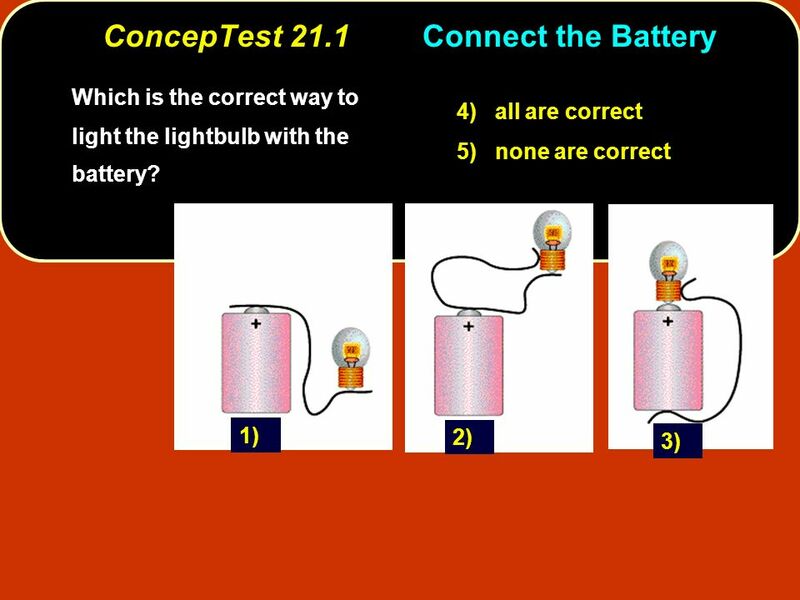 24 the point between the bulbs is at 12 VBut so is the point between the batteries When the switch is open, the point between the bulbs is at 12 V. But so is the point between the batteries. 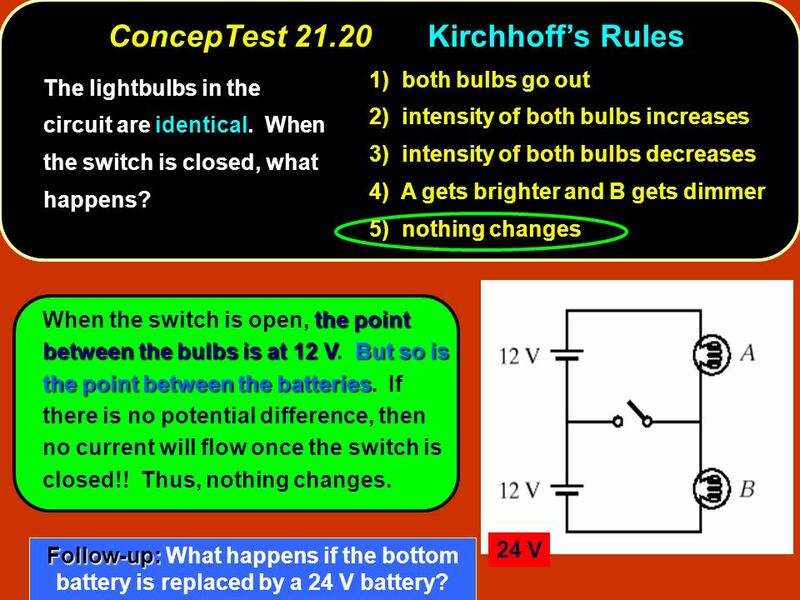 If there is no potential difference, then no current will flow once the switch is closed!! 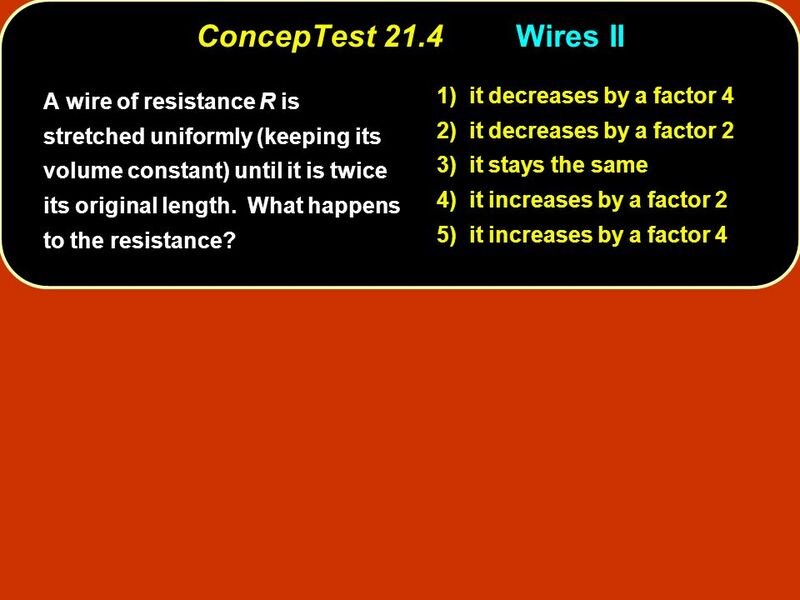 Thus, nothing changes. 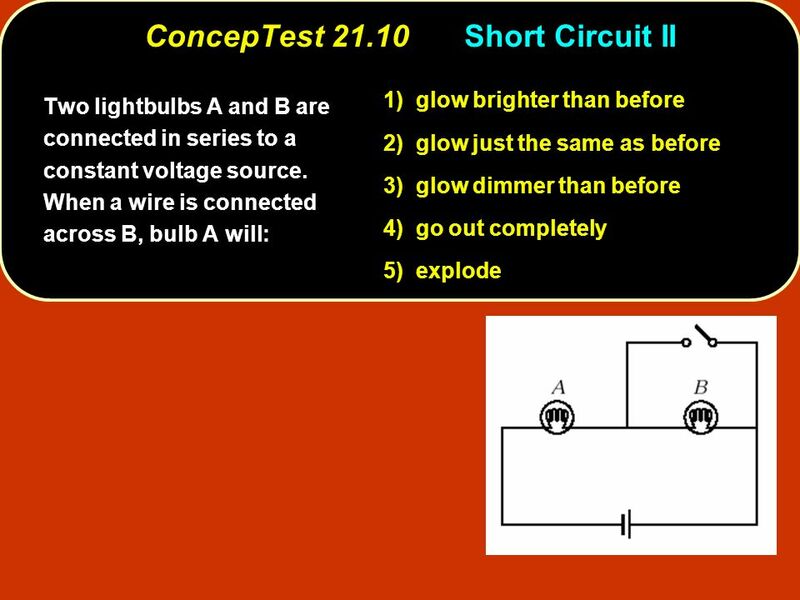 The lightbulbs in the circuit are identical. 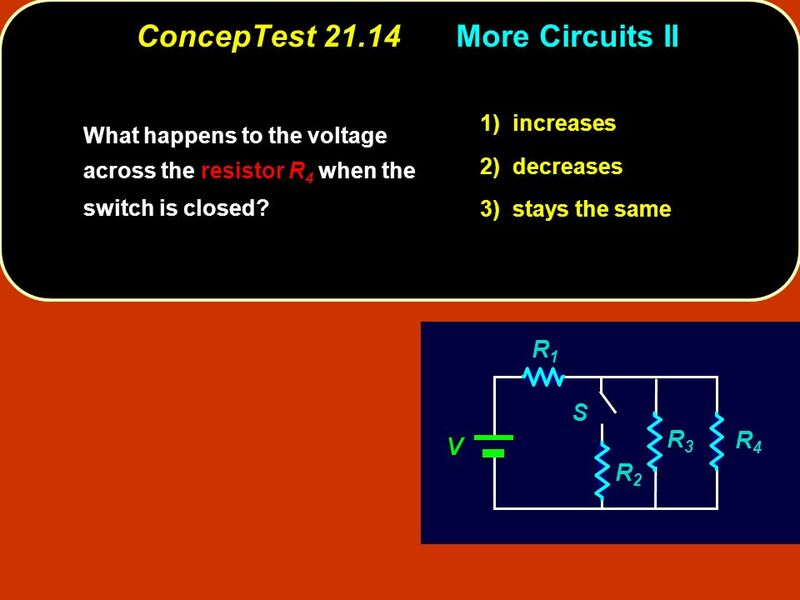 When the switch is closed, what happens? 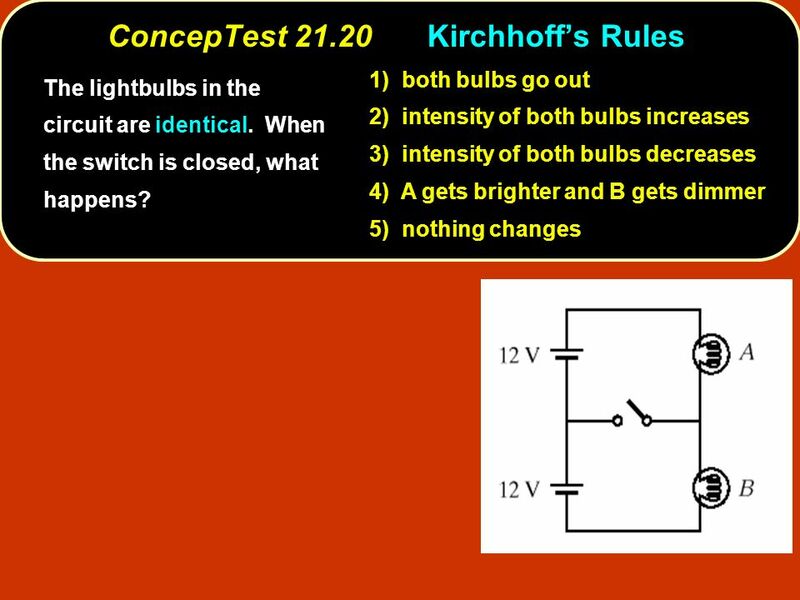 1) both bulbs go out 2) intensity of both bulbs increases 3) intensity of both bulbs decreases 4) A gets brighter and B gets dimmer 5) nothing changes ConcepTest 21.20Kirchhoffs Rules ConcepTest 21.20 Kirchhoffs Rules 24 V Follow-up: Follow-up: What happens if the bottom battery is replaced by a 24 V battery? 29 ConcepTest 21.23Capacitors I ConcepTest 21.23 Capacitors I o o C C C C eq 1) C eq = 3/2 C 2) C eq = 2/3 C 3) C eq = 3 C 4) C eq = 1/3 C 5) C eq = 1/2 C What is the equivalent capacitance,, of the combination below? 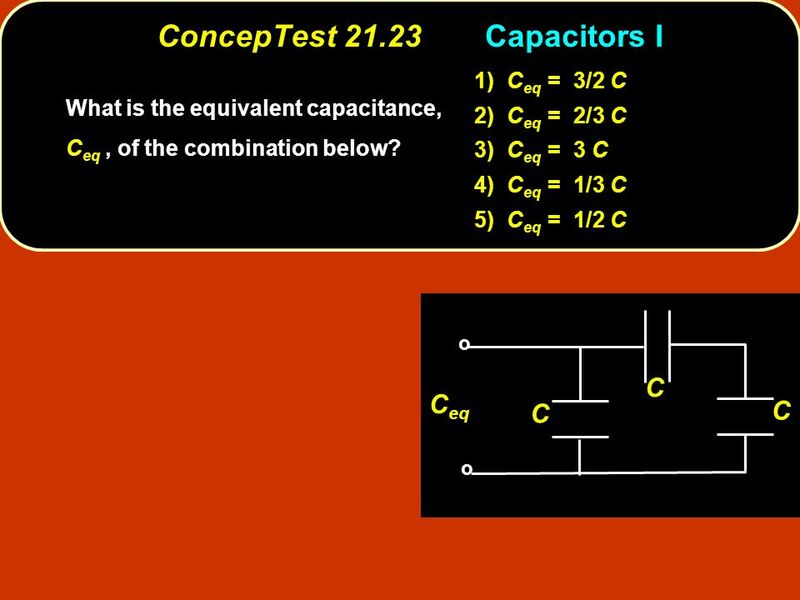 What is the equivalent capacitance, C eq, of the combination below? 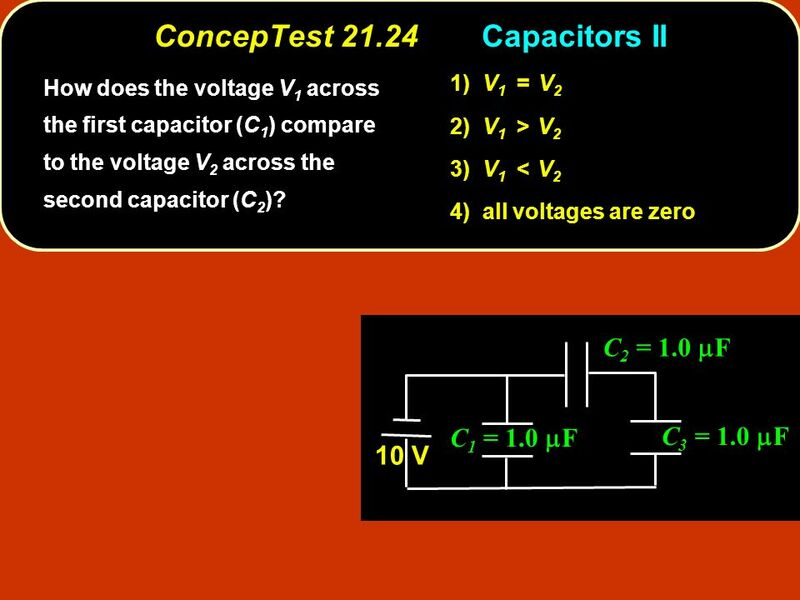 30 ConcepTest 21.24Capacitors II ConcepTest 21.24 Capacitors II 1) V 1 = V 2 2) V 1 > V 2 3) V 1 < V 2 4) all voltages are zero C 1 = 1.0 F C 3 = 1.0 F C 2 = 1.0 F 10 V How does the voltage V 1 across the first capacitor (C 1 ) compare to the voltage V 2 across the second capacitor (C 2 )? 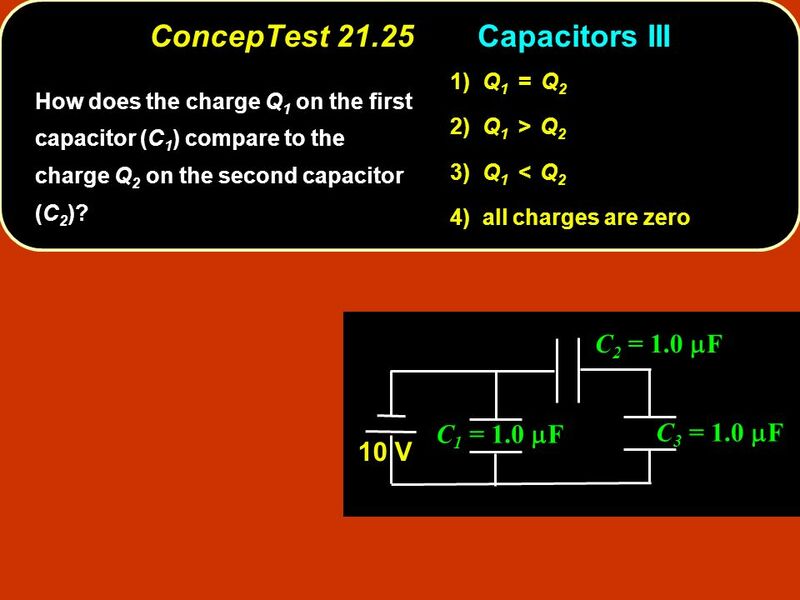 31 ConcepTest 21.25Capacitors III ConcepTest 21.25 Capacitors III C 1 = 1.0 F C 3 = 1.0 F C 2 = 1.0 F 10 V 1) Q 1 = Q 2 2) Q 1 > Q 2 3) Q 1 < Q 2 4) all charges are zero How does the charge Q 1 on the first capacitor (C 1 ) compare to the charge Q 2 on the second capacitor (C 2 )? 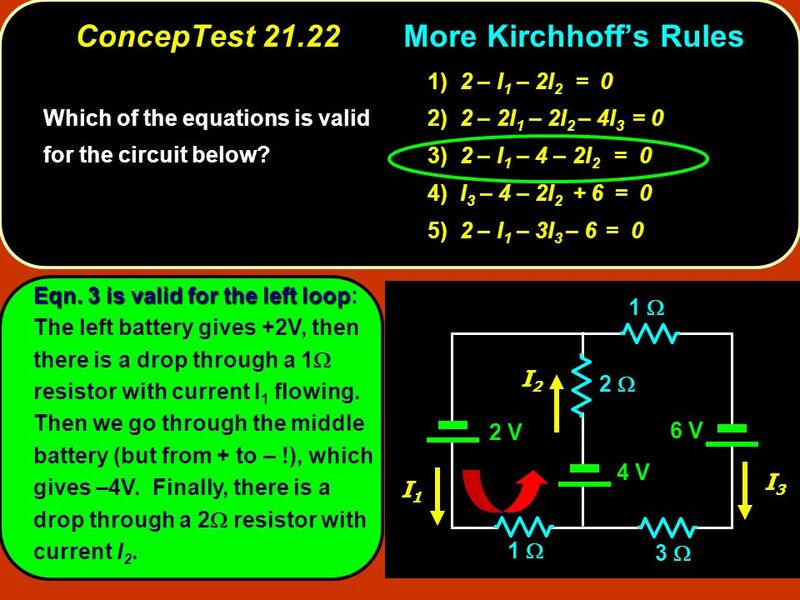 Chapter 26 DC Circuits Chapter 26 Opener. 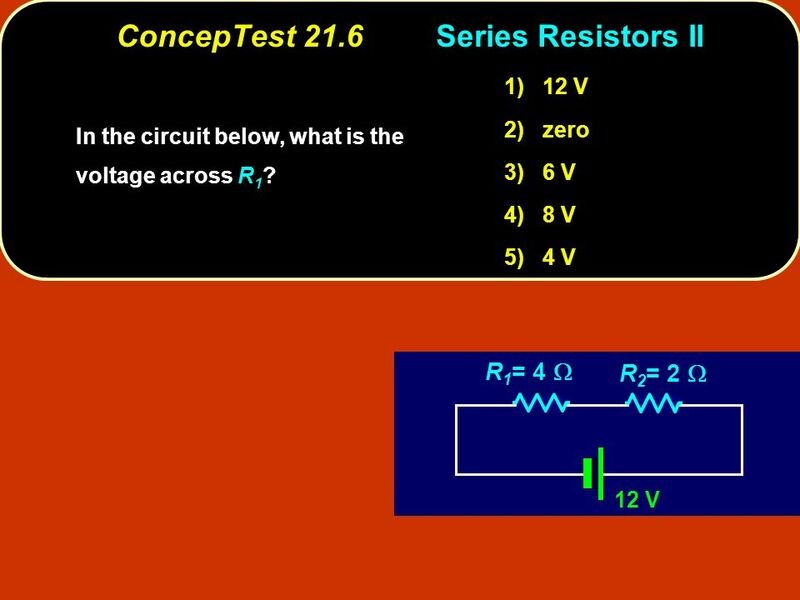 These MP3 players contain circuits that are dc, at least in part. 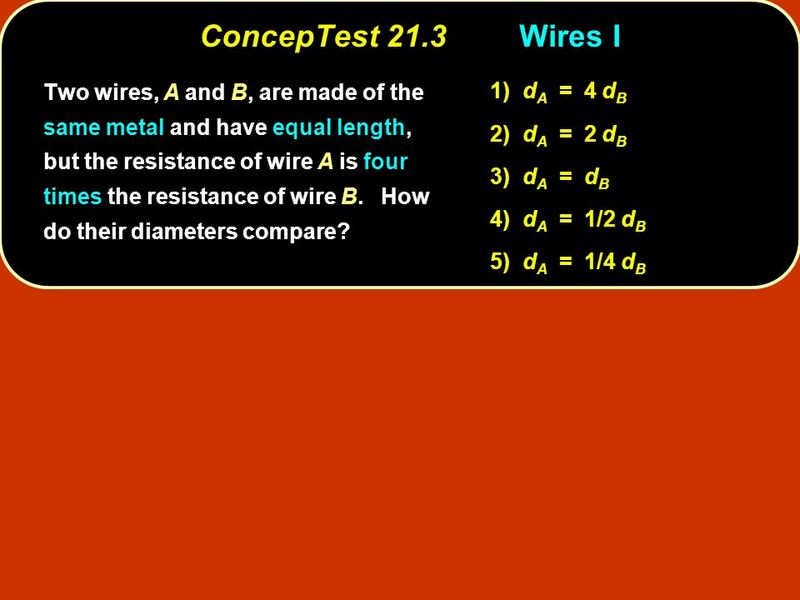 (The audio signal is ac.) 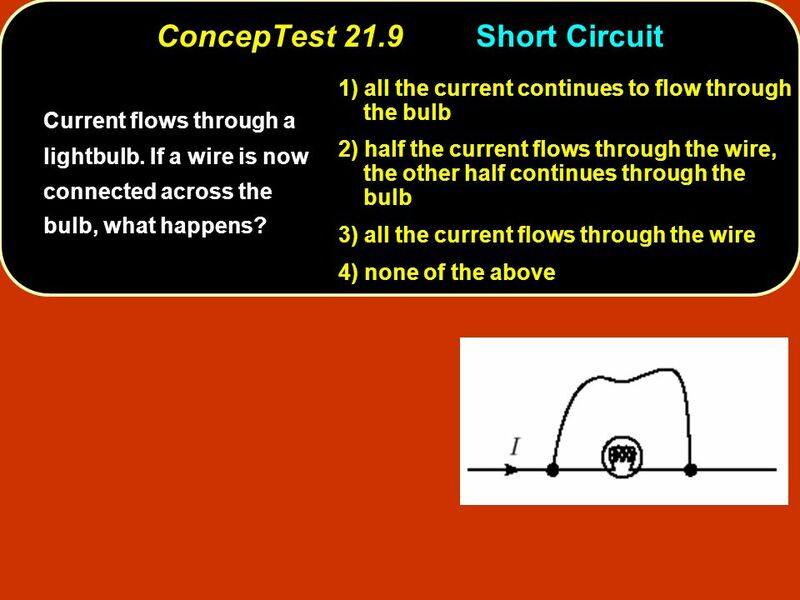 The circuit diagram. 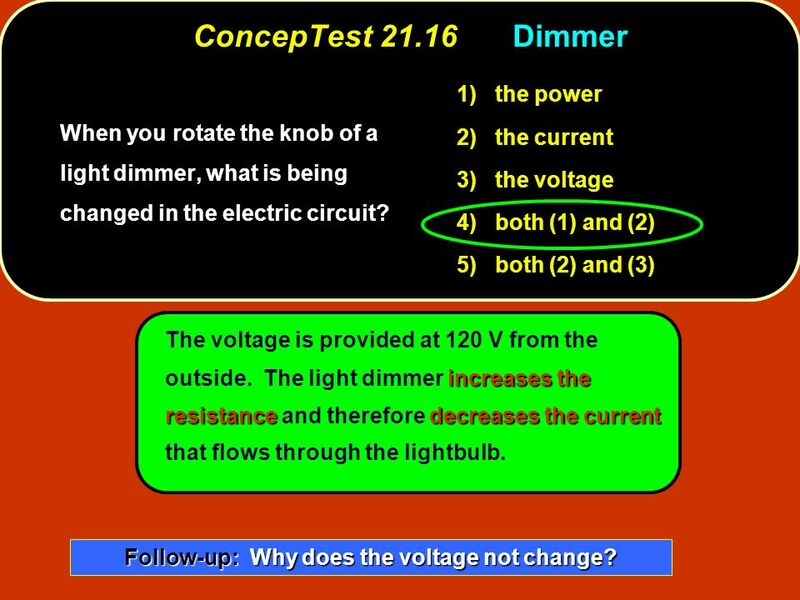 Electricity Review 10 MYP Science.